On May Day 200 people took the streets on a demonstration against gentrification and capitaklism in The Hague, Netherlands. Originally published by 1 Mei Den Haag. Translated by Enough is Enough. On the first of May 200 people demonstrated in The Hague (Netherlands). This year the demonstration focussed on the struggle against gentrification. The demo marched from Hollands Spoor to Eilandplein. On the route there was a banner drop “For the revolt, for Anarchy!”(image above). 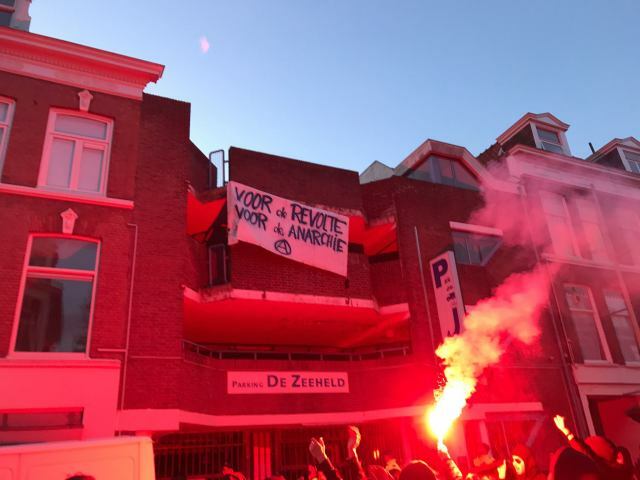 In the Roggeveenstraat residents hung out a banner “Gentrification = class struggle”. Several residents also had a poster of the demonstation on their window. During the demo several people spoke. Somebody from the “Bond Precaire Woonvormen ” (association precarious dwelling forms) spoke in front of the Student Hotel. The Student Hotel can ask huge sumsfor a room because of the shortage of affordable apartments for students. Somebody of “Fair City” spoke in the Boekhorststraat, a street where a gentrification process is developing at the moment. A speaker of the “Koerdische Federatie” (Kurdish federation) spoke about the first of May and the necessity to organize ourselves. During a speech at the final point of the demo somebody of “Noodzaak” (need) made clear that we have to connect the different social struggles with each other. We hope that the demonstration will inspire people to fight the social struggle against making The Hague a yuppi city. Don’t allow the politicians and project developers one moment of calmness. We now say, until here and not more. We don’t let them drive us out. We demand the city for us! It’s our city! New shirts and other stuff in the Enough is Enough shop. Support our work. Click here.